Since I have the drum seat filled and am on the lookout for a guitarist, this leaves me with plenty of behind-the-scenes responsibilities to get the live ensemble off the ground. As the bass player and the keyboardist, I have a number of considerations to dispose. The first is when to play what. The bass, the bottom, is often what makes the music sound finished. Without something happening in the lower register, a set of drums can serve more as a reminder of holes in the arrangement than as a driving foundation. Since the music I’m doing at present wasn’t recorded with a performing trio in mind (like Rush or to a somewhat lesser degree, Led Zeppelin), I have to be sure that all of the parts are covered to make the tune recognizable and cohesive. Can I cover it on bass? Good. No? OK. To the keyboard! When I play keyboards, I’m obviously out of hands to play bass. For me, there’s usually only one solution to that problem: splits. “Split” is a term used to describe what we can do with these new-fangled keyboards all the cool kids are using now. When I split the keyboard, I can play a different instrument with each hand and cover two parts. It’s very…handy. One portion of it sounds a like a bass instrument. I play that with my left hand. The remainder of the keyboard triggers a more traditional keyboard sound. Sometimes, the two sounds cross in the middle somewhere. In the old days, keyboardists had different instruments in their rigs to do different jobs. (Some still do, but I’m on a budget and I still have to bring bass gear everywhere too…geez…) If you ever saw the Doors on video, you may have noticed Ray Manzarek covering bass parts with his left hand on a Fender Rhodes Piano Bass while playing the Vox Continental organ with his right hand. (Yeah kids, they had no bass player.) The Piano Bass could provide good bottom if you amplified it well enough. It also had an immediacy to its tone that lent itself well to providing good rumble with a drummer. This isn’t a simple affair, since the way one approaches a keyboard instrument lends itself less to that rhythmic role than an actual bass guitar fills. 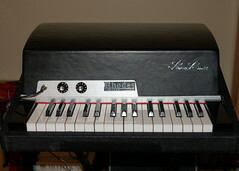 For that reason, I often use a synthesized Fender Rhodes somewhere in my keyboard bass patches. I’ll use anywhere from three to four combined sounds for my bass patch. Other than the Piano Bass, I use a sampled electric bass, a Moogish bass that sounds like Stevie Wonder’s, some low organ and a sub-bottom saw-wave synth patch that’s more felt than heard. These are layered according to the requirements of the tune. My keyboard rig is simple, a 61-key controller and a synthesizer module. I usually have the controller sending messages on 2 midi channels at once. To set up splits, I assign the bass voices to one channel on the synth and the keyboard voices to the other. Then, I determine the highest note on the keyboard that I’ll need for the bass part. If it’s not too far into the “keyboard” range I set the bass voices on the synth to respond only to note messages up to that note. Then I set the keyboard voices to respond to note messages only above that note. (If the bass part goes too high, as sometimes can happen with only 61 keys, I set the split point lower and try to play certain bass runs in a different octave to make the arrangement work. Helps to know your stuff musically here…) When I have the configuration right, I save it to a preset that I can recall with a keyboard button programmed to send a patch change message. Instead of changing the way the synthesizer “listens,” you can also set split points using the keyboard so that it only sends the note messages that you want to trigger, but my particular controller doesn’t enable you to save those configurations and recall them with ease.